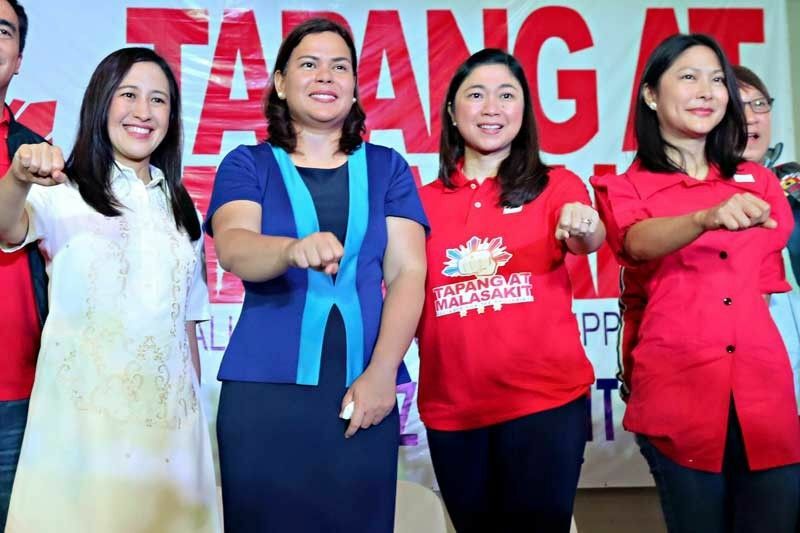 Quezon City Vice Mayor Joy Belmonte, Davao City Mayor Sara Duterte, Taguig City Mayor Lani Cayetano and Undersecretary Karen Jimeno flash the Duterte fist during the launching of the Tapang at Malasakit Alliance at Trinity University of Asia in Quezon City yesterday. MANILA, Philippines — Following the renewal of a sister city memorandum between Davao City and Quezon City, Mayor Sara Duterte officially launched the “Tapang at Malasakit Alliance” yesterday in collaboration with Vice Mayor Joy Belmonte. Held at the Trinity University of Asia, the launch was attended by councilors and city officials as well as various groups representing overseas Filipino workers (OFWs), single parents, women, youth, senior citizens and tricycle operators from. The Davao mayor lamented that when her father took office, the various members of the alliance overlooked the original reason why they supported the candidacy of President Duterte in the first place. “Nakalimutan na ng lahat ng volunteers kung bakit natin sinuportahan ang kandidatura ni President Duterte. Gusto natin makita ang tunay na pagbabago (All his volunteers have forgotten why they supported the candidacy of President Duterte. We want to see genuine change),” she continued. “Nakalimutan natin na kailangan nating ipagpatuloy ang volunteerism, hindi man on a national level, hindi para sa buong bansa, but kahit doon sa sariling communities natin, sa sariling barangay natin (We’ve forgotten why we need to continue volunteerism – maybe not on the national level, not in the entire country, but in our communities at least, in our barangays),” Mayor Duterte said. The event was also led by Tapang at Malasakit executive director Undersecretary Karen Jimeno and Taguig City Mayor and Tapang at Malasakit convenor Lani Cayetano. The presidential daughter’s Tapang at Malasakit launch was the third pit-stop in the morning of July 23 to celebrate the renewed alliance of Quezon City and Davao City. Earlier that day, Mayor Herbert Bautista and Belmonte welcomed Duterte and other dignitaries from Davao in a landmark renewal of sister city ties that was first signed by then Davao City Mayor Rodrigo Duterte and then Quezon City Mayor Ismael Mathay in 1994. On the same day, the presidential daughter also distributed school supplies and health kits to 500 women aged 18-30 and 500 children aged 8-12 at the Brgy. Pinyahan Covered Court in Quezon City as part of her Pagbabago Program. Mayor Duterte and Belmonte first joined forces in a Tapang at Malasakit event in Hong Kong and Macau in February that launched the volunteers’ movement among OFWs abroad.